Column index The column number of the value to return. Range look up Optional - set to False for exact match only. The VLookup function can be a useful Excel function. Even though it is straightforward to use can often be confusing when used in VBA. In this post, I am going to show how anyone can easily use the VLookup function. I’ll also cover the pitfalls and how to avoid them. Of course, not post would be complete without a ton of examples that you can try for yourself. If you are not familiar with VLookup in Excel then this page provides a great introduction. Notes: I use the Underscore character(_) in the code examples. In VBA this allows you to split a line over multiple lines e.g. Note: The variable shData in the examples refers to the worksheet by the code name. You can replace this with the code name of the worksheet you are using. The code looks for the text Pear in the range A2:B7. When it finds the text it returns a value from the same row as the text. The value in determined by the column number argument. We used 2 in this example. lookup_value – The value to look up. It must be in the first column of the range. table_array – This is the range to search. This can also be a VBA array although it very slow using this. col_index_num – This contains the column number of the return value. Starts at column number one. range_lookup(optional) – Use True(default) to find closest match. Use False to find exact match. Using True assumes that the first columnis sorted alphabetically or numerically. We will look at these parameters individually starting with the lookup_value parameter. This is the value that you are looking up. It must be in the first column of the Range. 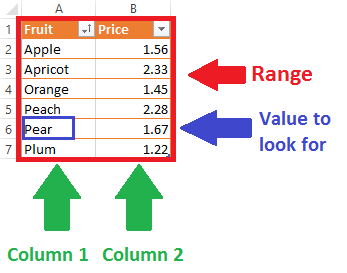 If you are using the range C4:X10 then the lookup value must be in column C. If you are using the range Z1:AB5 then the lookup value must be in column Z. If the number is stored as text then the search value must be a string. If the number is stored as a number then the search value must be a number. In this case, the lookup value must be a Long or you will get an error message. You can also use the Double data type if you are looking up a decimal value. As in the case of an integer it must be stored as a number if you want to use Double. Using a Date type is a tricky business. VBA has a Date data type but the worksheet does not. This parameter refers to the range of the data we are looking up. You will normally use a range for this as we have seen in the examples so far. If you are using a worksheet table you can use the range of the table. You can also use a VBA array with VLookup but this tends to be very slow. This parameter refers to the column which contains the value you want to return. Column 1 is the leftmost column of the table_array. If the column number is greater than the number of columns in the range you will get an error. See The VLookup Error Types section below. This is an optional parameter. If it is not used then it takes True as the default value. False means that an exact match must be found. True means that an approximate match will be returned. The first column must be ordered numerically or alphabetically for this to work correctly. The difference between them is how we handle errors. Let’s look at each of these in turn. Using WorksheetFunction.VLookup requires us to use On Error to trap the error. We can then check the error number Err.Number to see if the value is valid. Debug.Print "Could not find value: " & "Plum"
The following table shows some common errors you may encounter with VLookup. If you’re having trouble with a particular VLookup error then it is a good idea to try it in Excel first. Error 2015 #VALUE! The column number is less than one. #VALUE! You used a string instead of a range for the table_array parameter. Error 2023 #REF! The column number is greater than the number of columns. Error 2042 #N/A The value is not found. See possible causes below. Ensure the Table/Range is correct. Ensure the Table/Range does not include the header(VBA will think list is unsorted). Ensure the Table/Range is using the correct worksheet. If searching for a number stored as text use a string data type in the lookup_value parameter. If searching for a date convert it to a long(see Date Type above) in the lookup_value parameter. Sometimes you may need to perform a large number of lookups. In these cases, VLookup could be too slow. The VBA Dictionary is faster when dealing with a large number of lookups. The following code shows an example of using the Dictonary. Thank you Paul, for writing this. What else to say!! As you already know index match is much more efficient than vlookup which can further enhance the value of this topic. How about educating your audience in that area. In no way, I mean to under rate what you written for us. first of all i like your explenations its great. I had a question. how do i get de results on a field i want? How can we give 2 lookup values and get the result in single cell. Kindly help me on this. The best way is to create a column that combines the two values. I have some data I get from the MRP system once a week. It contains over 70 000 rows (each for the single stock unit). One of things I need to do is pasting additional data in a column corresponding to those stock units). 3rd method – 33 seconds. Thanks for those comparisons. They are interesting to read. It’s another illustration of how memory is much faster for dealing with large amounts of data. shData is the worksheet variable or code name of the worksheet. Hi Kelly…I want to achieve VLOOKUP using dictionary, in getting this resolved I need your assistance. 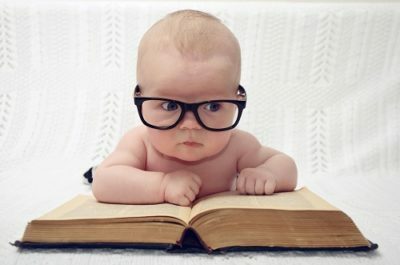 As always, your article is very clear, but I’m still not sure where I should use vlookup over other methods? Are there any hidden upsides? You normally use if the data is already on a worksheet and the format is suitable. If you are going to be doing lots of lookups then a Dictionary is much faster. shouldn’t these examples DIM shData? I’m guessing Dim shData as Range. of the worksheet. You can refer to the worksheet directly using the code name from the same workbook. I will update the post as it is not clear. 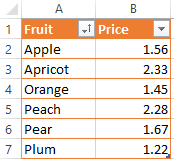 If there is a duplicate in column A (A6=Pears and A8=Pears), how do I get the result for the second entry? I am using a user form with a text entry to look up data. VLookup expects the lookup value to be unique. If you can make them unique e.g. using firstname and surname it is the best solution. You can also use Find. This can be slow if there are a lot of items. I am trying the vlookup with two textboxes how do I get the same instead of msg box.. I have two textbox in my userform, when I enter the name in first textbox I want to perform the vlookup function with value and get the lookup value in textbox 2. 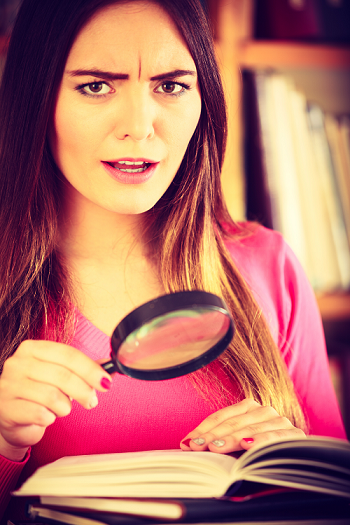 It’s not possible to find the problem without seeing the data you are using. Put a breakpoint on the line with the error. Place the different parts in the Watch window to find which part is causing the error. i want to do vlookup between two sheets. in second sheet i have two columns. how to use dictionary method for Vlookup approximate match? You can use the Like operator. The VBA is throwing a run time error instead of continuing to loop through my range. The following section shows how to use Application.VLookup and WorksheetFunction.VLookup when dealing with errors : Dealing with Errors in VLookup. You are getting a Type Mismatch. The variable x is an integer and I am guessing that the value of Worksheets(1).Range(“I” & i).Value is text. Place the cursor over value and the actual value of the cell should appear. Without seeing the data I would only be guessing at the issue. Try using the VLookup as a formula in a cell and compare the parameter values with the code parameters. This should get you closer to a resolution. What would be the best method if I wanted to send a message to be copied to a template Letter if 3 conditions come up? So, for example, I have 3 funds from a tab named FRED which has over 21,000 of data in it and when the commands come in to run in the template to create the letter, I need to search through this data in FRED to see if these 3 funds come up, and if they do come up, a separate letter needs to populate to the ‘Letter’ template. The spread sheet is using vLoopup throughout the program with only 2 macros running. I’ve been trying different techniques that I’ve been learning, but still a bit confused. Would you suggest running an Array through the data to search then inserting a if/then statement? Any help would be greatly appreciated. How to fill different target cell with vlookup ? For next month, the macro will fill cell (D4 for Jack, E5 for Oneil and F6 for Harry) and so on. In a single click of command button. You can use the Cells property of the worksheet. Hi, i am using the following VLOOKUP comment which works great! and really could do with this working in Hlookup however it doesnt work, are there different parameters for Hlookup? What you mean by “doesn’t work”? Create the Hlookup formula in excel first and when you are happy with it then add it to VBA. The parameters are the same apart from taking row instead of col.
Hello Paul, Perhaps you can help me. I have a number of workbooks I must “combine” into one master worksheet every day. Currently it takes me about an hour to accomplish. The issue is in order to combine them I must run Vlookups on each “ID” from the master worksheet for each workbook and each cell I want to update, and I am updating 26 cells per ID. Is there a way to quickly do this? Below is the macro I am using, again this only updates one cell where I need one macro to update all cells. I hope that makes sense. There isn’t a quick way to do what you require. You need to create a small VBA application to accomplish this. Fun bug I just found: VLOOKUP does not work for exact match if “~” (Char(126)) is in the string. No idea why. I replaced ~ with chr(14) and now it works fine. I would like to ask you, why doesn’t it work, if I use sRes as currency in your example where trying to trap the error with IsError(sRes), but it does work when trying to trap it with Err.Number = 0? In the first example it still gives me error, in the other, it works smoothly. Application.VLookup returns a variant type. This means it decides the type at runtime. If there is an error it will return an error type. So if you use a currency type then it cannot be an error type. I am trying to make a code that gives the user a simple template. The user will place a product name into cell b12 and the code will look on a file they selected for the product (note there are over several hundred products). How do I make it so that once they place the product name into the cell, the code will go to the other page and find the product?